Welcome Minnesota Public Radio Members! You now have access to hundreds of offers from local places you love thanks to your MPR membership. Below please find answers to your most commonly asked questions about using your MPR Member Rewards on the Chinook Book app. What Offers are Available Near Me? Find a searchable list of our Twin Cities offers here. 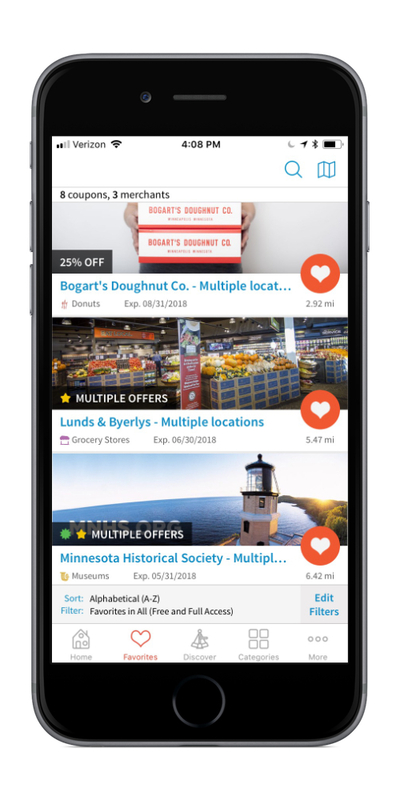 Want to see what offers are available in other Minnesota cities? Type the city you'd like to search for in the location field (circled in blue below). Where Do I Enter my Minnesota Public Radio Activation Code? Never used the Chinook Book app before? Download the app from chinookbookmobile.com and create an account by entering your email address and creating a password. You will then be prompted to enter an activation code. You'll find your unique 17 digit activation code in the email sent to you by Minnesota Public Radio. Tap the More... menu in the lower right corner and select Enter Activation Code. You'll find your unique 17 digit activation code in the email sent to you by Minnesota Public Radio. Take a quick tour of the app by tapping here from your phone. Find more answers in our help center or email us at support@chinookbook.com. Enjoy your Chinook Book and thank you for investing in our community!